Next: Tutorial 2: Adding formatting to the XLSX File. 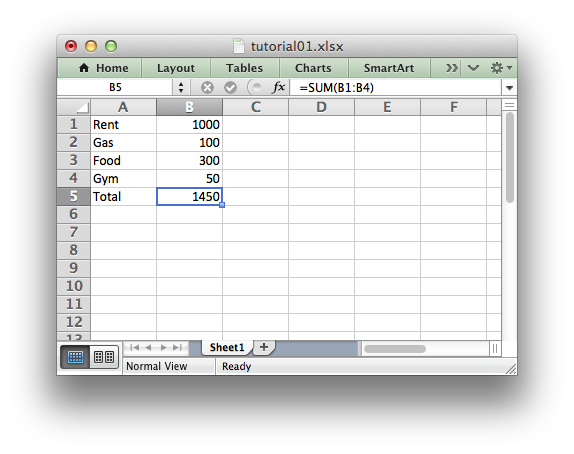 Let's start by creating a simple spreadsheet using C and the libxlsxwriter library. This is a simple example but the steps involved are representative of all programs that use libxlsxwriter, so let's break it down into separate parts. Then we need some data to add to the spreadsheet. For the sake of this example we create and initialize some simple data structures. In a real application the input data might come from a database or a file. worksheet = workbook_add_worksheet(workbook, NULL ); // Defaults to Sheet1. worksheet = workbook_add_worksheet(workbook, "Data"); // Data. worksheet = workbook_add_worksheet(workbook, NULL ); // Defaults to Sheet3. Rows and columns are zero indexed throughout the libxlsxwriter API. Thus, the first cell in a worksheet, A1, is equivalent to (0, 0). And that's it. We now have a file that can be read by Excel and other spreadsheet applications. In the next sections we will see how we can use the libxlsxwriter module to add formatting and other Excel features.